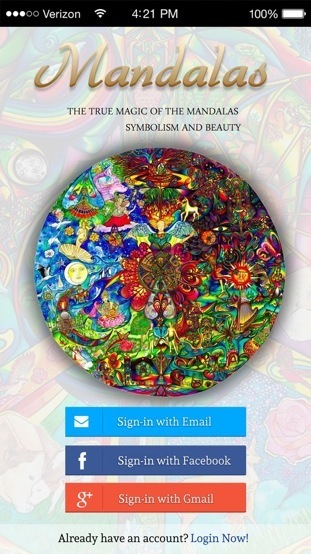 You can SIGN into the APP and create a profile using Email, Facebook or Gmail accounts.. 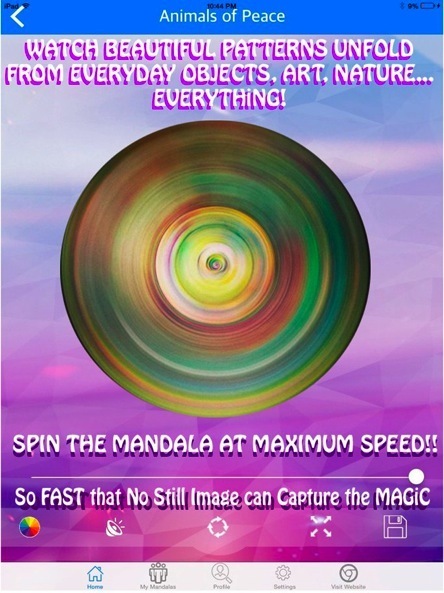 Soon your journey into the exploration of MANDALAS will begin..
with the Title MANDALA MAGIC! 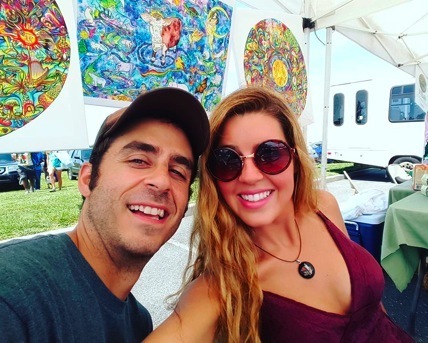 These 25+ Mandalas will be updated and change many times throughout the year... so keep checking back for more! 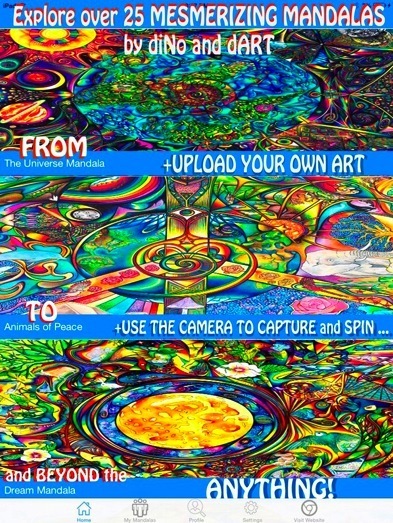 YOU can upload any image you want from YOUR library of Photos..
Or You can Use your Device’s Camera, and capture ANYTHING that YOU think will Look AMAZING... when spinning.. 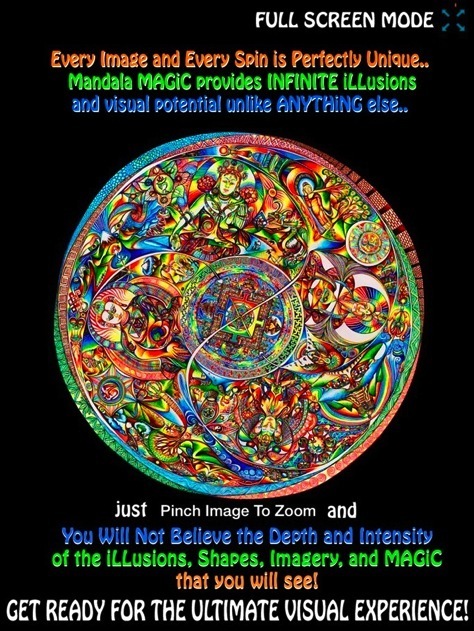 Here You Have INFINITE Ways to Experiment with the Visual MAGiC of YOUR Mandalas. 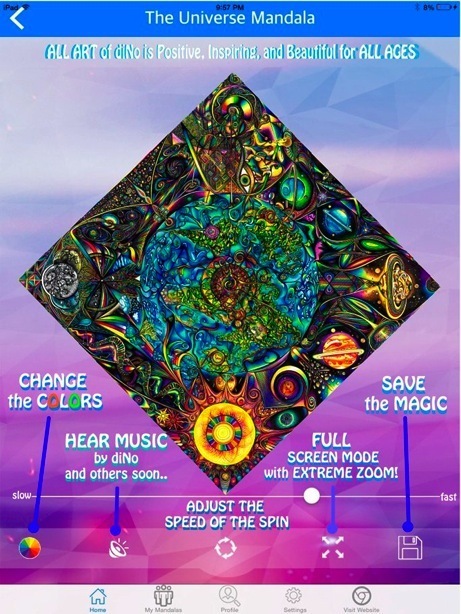 You Can Change the Color Scheme.. and then change it again.. and again.. and again..
You Can Listen to Creative and Fascinating Music recorded and performed by diNo... to help set the mood... if you would like to contribute a 1 minute musical LOOP to Mandala Magic..
contact dinorepress@aol.com with the title MANDALOOPS! You can control toe SPEED of the SPIN from a really slow RPM, to a REALLY Fast Level of SPEED! and there is also a trick to it... in order to obtain the hidden SUPER SPEED function.... you must experiment..
FULL SCREEN MODE with EXTREME ZOOM!!!!!!!!!!! 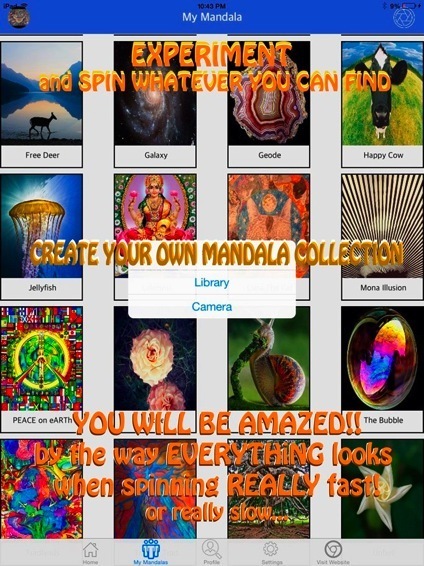 Now your Mandala will be taken to a new screen where it can be viewed at the previously chosen rate of SPEED, but with a Black Background. HERE you can PINCH the screen IN and OUT to utilize the INCREDIBLE ZOOM FEATURE! 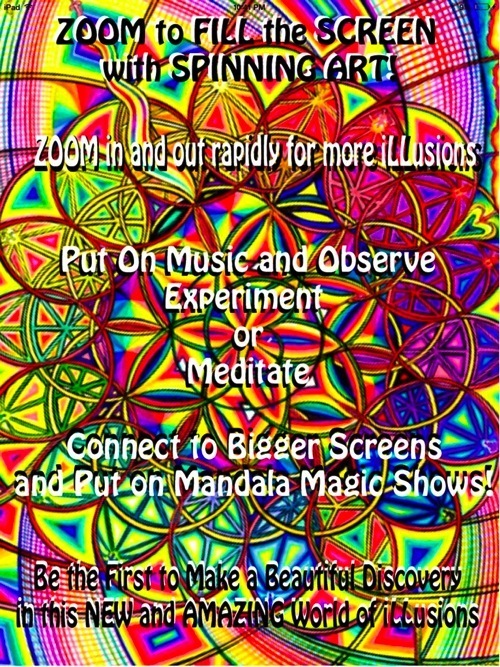 YOU can ZOOM OUT so far that your Mandala can appear smaller than a fingernail..
YOU can ZOOM IN so much that your Mandala can appear beyond the dimension of Pixels! 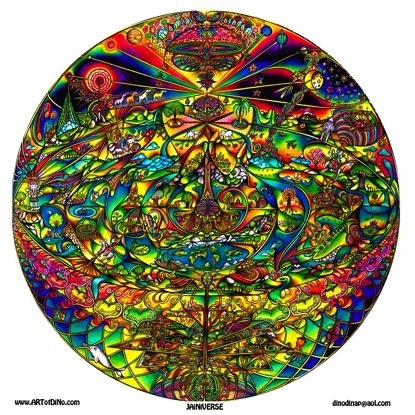 WATCH in AWE as beautiful and miraculously unique patterns emerge at EVERY single interval of ZOOM..
What appears will be AMAZINGLY unique to the viewer.. and often times can become shockingly symbolic when comparing the Patterns that Emerge, with the Symbolism attached to the image... and viewer.. 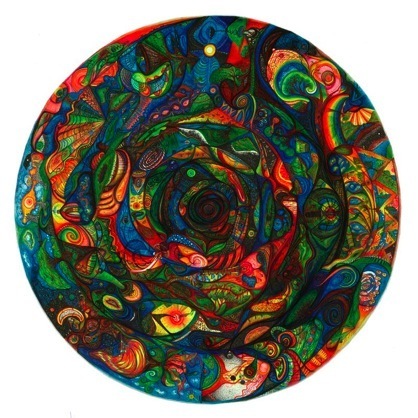 Imagine the ULTIMATE ‘Rorschach test’ of an entirely NEW and EXCITING UNEXPLORED DIMENSION! INFINITE VISUAL DISCOVERIES are waiting to be discovered... by YOU! The SPIN is SO INTENSE! that No Camera or still image could do it justice..
YOU REALLY MUST SEE IT TO BELIEVE IT! 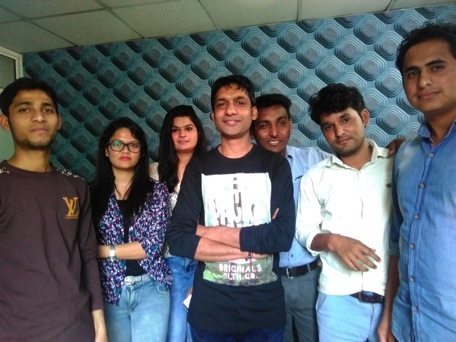 From Boston to India and BEYOND!